LOUISVILLE, Ky. - The Louisville Bats Baseball Club will donate more than $6,800 to Kosair Children's Hospital, the beneficiary of the first ever Star Wars Night held on Sunday, July 27 at Louisville Slugger Field. 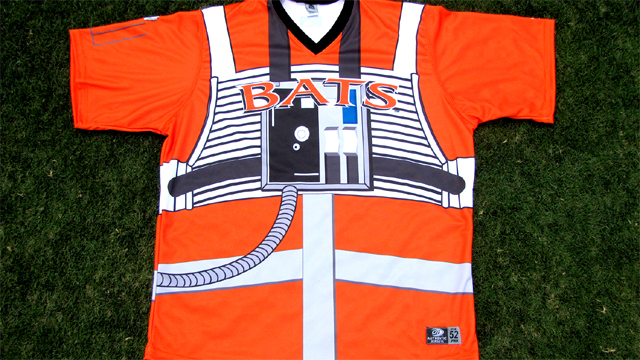 A crowd of 10,015 showed up at the ballpark to watch the Bats play host to the visiting Charlotte Knights in special edition Star Wars jerseys. On Monday, July 28 the authentic jerseys were put up for auction on batsbaseball.com and available for bidding until Monday, August 4. With the bidding period now over, the 50 jerseys were sold for $6,854.80 with all proceeds going to Kosair Children's Hospital. "Star Wars Night was a great success and we are pleased to be able to make this gift to Kosair Children's Hospital," said Bats President and CEO Gary Ulmer. For more than a century, Kosair Children's Hospital has cared for the children of Kentucky and Southern Indiana without regard to their families' ability to pay. Kosair Children's Hospital is Kentucky's only full-service, free-standing pediatric care facility dedicated exclusively to caring for children and is an advocate for the health and well-being of all children.